We now have a store hosting A-MUSE-A-PALOOZA in San Antonio, Texas! See their classes page for details and call the store to register! Make sure to check out Challenge Ten in the post below! Our next featured store is Crop 'Til You Drop in Dartford, Kent, UK. 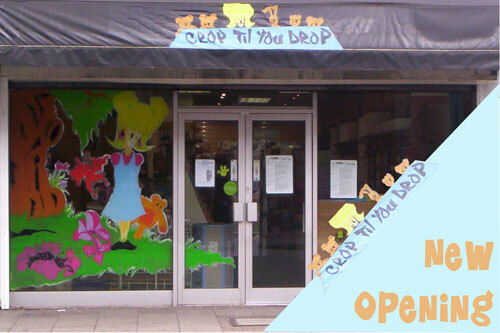 Beverley Todd, owner of Crop 'Til You Drop, opened her store two years ago in Dartford, Kent, UK and has never looked back, despite moving three times and suffering a fire at the store in May 2007. Without the support and encouragement from fellow crafters and a healthy addiction to paper crafts, Beverley might have let this setback be her last. But like a phoenix from the flames, the store now boasts a crafter's paradise on three floors with a much bigger classroom and a separate meeting room for groups. Beverley runs the store with help from her oldest son Sean, who is very useful for reaching high things, lifting heavy boxes and making a great cup of tea! He also does most of the 'gadgets' demonstrations. The store is a real family affair with Sean's cousin working Saturdays and Beverley's mom (mum to those of you in the UK!) organizing many of the regular Make N Takes. Their customers have become their friends with many of these friends helping out on busy days and even doing some demonstrations. Everybody is very excited that the store will be the only one in the UK to host A-MUSE-A-PALOOZA and with the new store opened just a few weeks ago, they have planned an action packed week. As well as a VIP event on Monday evening (July 9) there are classes, competitions, free drawings and Make N Takes, with something different every day! Visit their new store at 36 Lowfield Street, Dartford, Kent, DA1 1HD, England, UK. There is still time to participate in our ribbon design challenge - see Tuesday's post for details! Our next featured store is Ink About It in Westford, MA. INK ABOUT IT (www.inkaboutitonline.com) has been in business for three years and has carried A Muse Art Stamps from day one! The store is located in Westford, MA approx 45 minutes northeast of Boston. 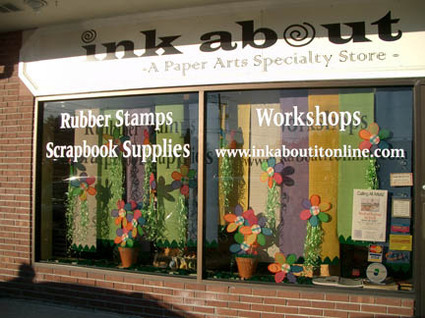 Ink About It is a paper arts specialty store featuring an extensive selection of rubber stamps, papers, inks, paper craft tools, and unique embellishments. Their goal is to bring customers the latest products from their favorite companies. New products are arriving daily and they order from A Muse almost weekly! Ink About It also offers a wide range of workshops to satisfy all levels of abilities, including monthly classes that feature A Muse Stamps taught by A Muse instructor, Jenn Shurkus. Class topics cover card making, scrapbooking, mini books, altered art, jewelry making and much more. 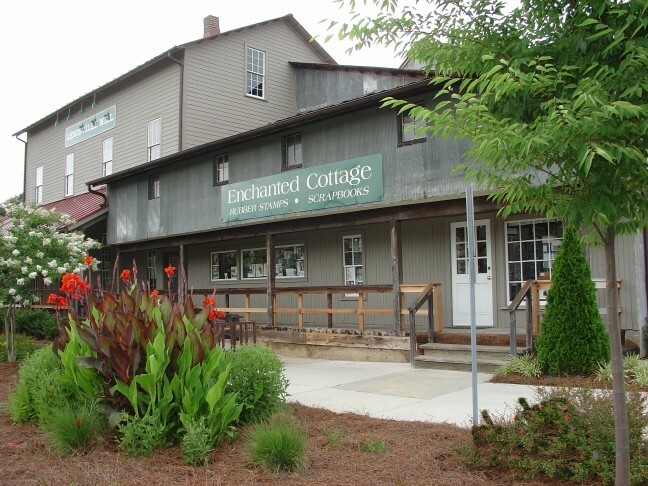 They have a talented staff of instructors and they frequently host guest artists as well. They are planning a fun filled week of activities in July to celebrate A-MUSE-A-PALOOZA. There will be special classes featuring the newly released stamps in both July and August. They will be debuting the new stamps and having a free make & take on July 10th. There is still plenty of time to enter our Scavenger Hunt and to participate in the weekly design challenge! Our next featured store is Scrapbook Friend'z. 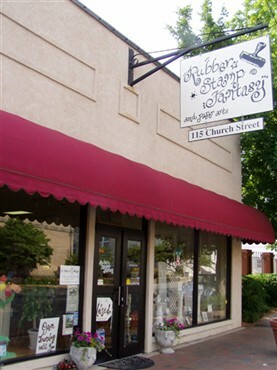 Scrapbook Friend’z, located in Bloomington, IL, has over 3000 square feet of stamping and scrapbooking supplies. They have been in business over 4 years and have 5 employees. The store has a modern décor and is part of a strip mall. Owner, Margaret Trost, first got into papercrafting as a hobby but it quickly developed into a passion. After working at another store for a short time, she decided to open her own business. Her favorite A Muse stamp design is the bird cage. It was a love affair from the moment she saw it! She also thinks the A Muse Notecards are “just fantastic”. 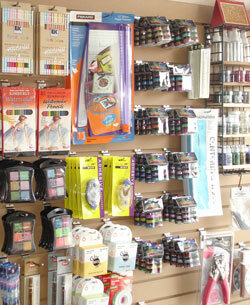 The customers that shop at Scrapbook Friend’z are part of a scrapbooking and stamping family. The employees know most of their customers by name and see many of them more than once a week. Their customers are adventurous and love new products. For A-MUSE-A-PALOOZA, they have two card classes planned during the week of the event. Then on Friday night July 13th, they’re having an A-MUSE-A-PALOOZA Friend’z party where they will stamp from 6pm until midnight! Saturday and Sunday they’ll have Make and Takes and there will be giveaways and prizes all week. Remember to enter your Scavenger Hunt answers and submit your card for Design Challenge 7! 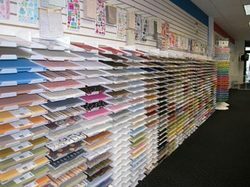 Our next featured store is Pad to Paper. Pad to Paper is located in Hilmar, California - right in the heart of the San Joaquin Valley. They officially opened their doors on October 7, 2006 with a grand opening celebration two weeks later. The store is located in the old post office building on the main street of this dairy farming community. They have approximately 1500 sq ft, which includes a classroom and office space. 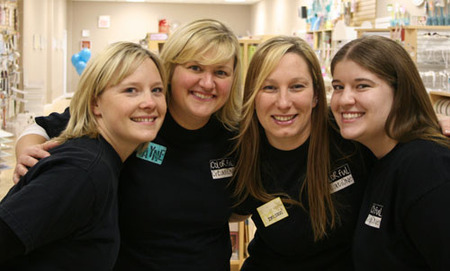 There are three partners involved in the store and they handle everything from ordering, to stocking, to teaching classes. Pad to Paper started as a long-time dream for two of the partners, Beth and Denise, who have been stamping for many years. The third partner, Diann, started stamping a couple of years ago, and was excited to become a part of this dream. The name for the store - Pad to Paper - came from Beth's nephew who gives everyone a hard time about stamping "What's so hard about that?, he said, It's just pad to paper". When they decided to open the store, coming up with the name was the easy part!! The store is packed with lots of stamps (A Muse, Hero Arts, Rubber Soul, Paper Inspirations, Inkadinkadoo and others) and a large selection of papers from World Win, Bo Bunny, Cosmo Cricket, Polar Express, Scrappy Cake, etc. They also have a whole room packed full of embellishments for scrapbook pages, cards and other paper craft projects. Pad to Paper customers come from all over the area and they've been told that they are "providing therapy and changing lives," but most importantly, their customers are having fun!! They have a full week of events planned for A-MUSE-A-PALOOZA, leading up to a Friday night VIP event and a weekend full of A Muse cards classes and specials. Be sure to check their web page (www.padtopaper4.com) for updates. This promises to be a fun event for everyone! Make sure to see the sneak peek before it disappears Saturday! And there is still plenty of time to heat things up for Challenge 6 - see post for details. 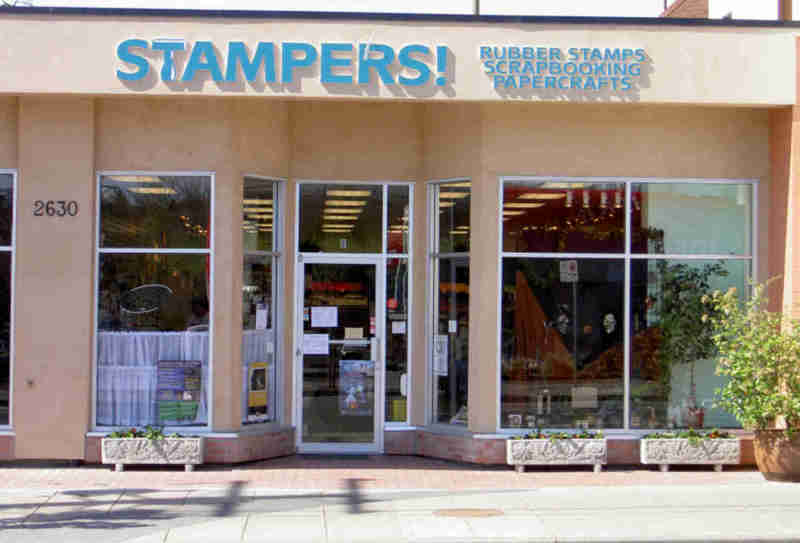 Our next featured store is Stampers! 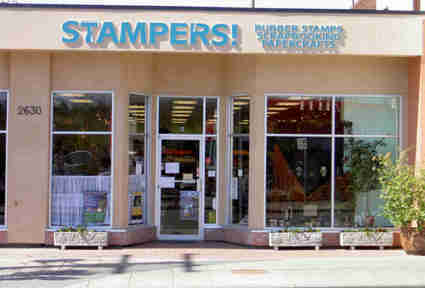 Stampers! is located in beautiful Victoria, British Columbia and has been in business for 12 years. 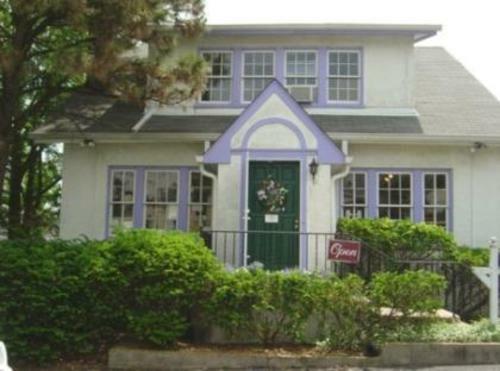 The store is in a little neighborhood commercial village, on a busy arterial street. The owners, Steve and Ann Thompson, describe it as an eclectic shop with a little over 1600 square feet of space. They run the shop with two other employees. Stampers! carries a couple of dozen stamp lines, various paper lines, and some accessory/embellishment products as well. The best thing about the customers that shop at Stampers! are the friendships that Ann and Steve have made over the years. Their customers always inspire and amaze them with their creativity. They have lots of fun events planned for A-MUSE-A-PALOOZA. There will be make & takes every day of the event from 4-5:30 pm, and on Fri & Sat (July 14, 15) they will have cake, coffee and juice. Steve is working with a local bakery to try & have the AMAP logo recreated on the cake. (How fun is that!) On Saturday, they will also have a "spinning wheel", where customers will spin for free stuff or discounts on their A MUSE purchases. Make sure to enter your guess for our Secret Squares game and don't miss Challenge 5! Our next featured store is Artsy Tartsy. Artsy Tartsy Inc. has two fabulous paper crafting stores located in MN. The 1st store in Savage, opened in Dec 2003, with the 2nd location, in Plymouth, opening in Feb. 2005. Both stores are located in high traffic strip malls, with Plymouth being the larger of the two stores. Owner, Julia Roehl, oversees both locations and has 4-5 part time employees per location to help her out. The stores are modern and trendy and have constantly changing products and inspiration. They offer scrapbooking, beading and rubber stamping and carry all the latest trends from the most popular vendors. Her customers love new products! Julia has always loved paper and color. She started out scrapbooking about 9 years ago and it all snowballed from there. With a background in retail and merchandising, this was just a natural fit for her when she decided to start her own business. Her favorite A Muse stamp is the Scallop oval frame, she absolutely loves it! Artsy Tartsy will be having a VIP party after hours on Monday night (July 9) to kick off A-MUSE-A-PALOOZA. They will feature a different stamp each day the rest of the week in their “A Muse Yourself” Art Bar! They will also be offering several classes and make & takes during the event!